It's not very round, and it's probably made by breaking every felting rule there is, but it's bright and cheery and Ernest loves it. 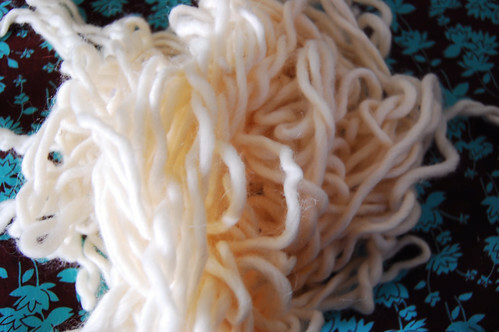 This ball started out as a skein of luscious yarn, chunky and smelling divine of lanolin. There wasn't enough to do much with, so it lived in one of my treasure baskets that I use with the little ones. After lots of play though it had become something of a tangled mess. I decided to try and rescue it into something and after lots of squishing and squadging with hot soapy water, I shaped it into a ball, rolled it into a sock, tied the sock in a knot and shoved it into the washing machine on a hot wash with a load of laundry. 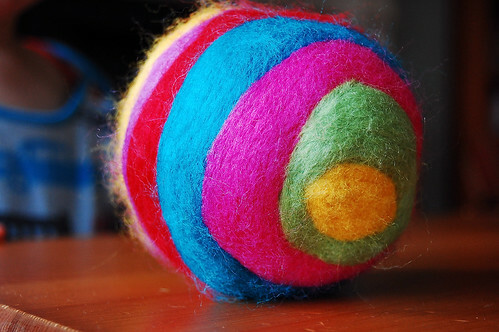 That gave me something resembling a ball, and I set about needle felting some bright colours onto it. 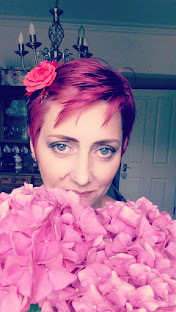 So, anyway, here it is, my not very round ball. Gorgeously bright colours. 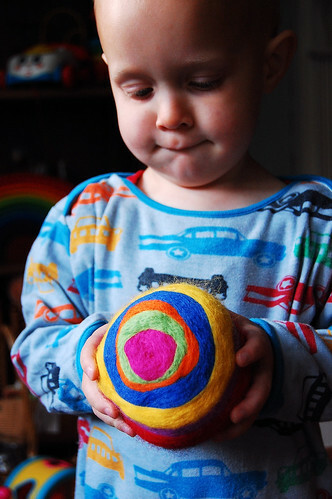 Wool felted balls are such a hit in our house too.